Cherie Gratia and Todd Kast, both 28, recently came from Houston to be married in New Orleans and hired a six-piece brass band to lead their wedding party through the French Quarter. Guests waved large white handkerchiefs, and the couple pumped decorative parasols in the air as they made their way from the church to the reception. “It’s a great place to party,” said Ms. Gratia, a native New Orleanian, as the procession moved down the street. Looking on dumbfounded as the wedding party and all 180 of the guests danced their way past was Michael Lowe, in gray suit and bow tie, visiting from Washington for the weekend. “This is a more spectacular version of a wedding than we’re used to,” he said. Mr. Lowe was witnessing what is locally known as a second line, an originally African-American custom of a procession led by a brass band. Destination weddings are not new, of course. Disney World, for instance, hosts a variety of wedding packages, and everyone knows about Las Vegas’s drive-through options. 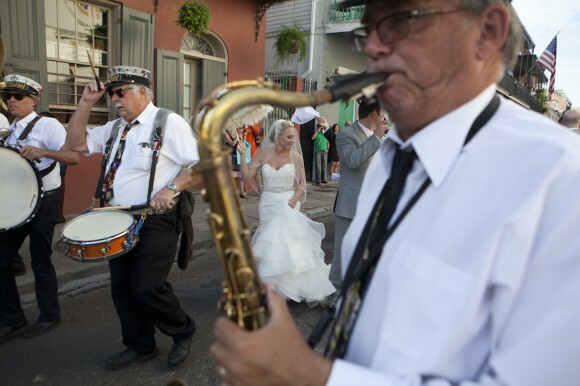 But in recent years, wedding parties from all over the country have been descending on New Orleans for its celebratory culture, jazz roots, preserved architecture and multicultural cuisine. That, coupled with the growing trend of destination weddings, is making New Orleans a top pick for couples who wish to start their special day in a church and end it with a parade through the streets in their honor, Mardi Gras style, rather than Mickey Mouse style. “Most of our couples are from out of town,” said Sarah Worsley, the venue manager at Race & Religious, one of New Orleans’s popular wedding locations (named for its location at the corner of Race and Religious Streets). On a recent weekend she had a couple from New York on Friday, a couple from Texas on Saturday and one from Pennsylvania on Sunday all tying the knot at her rustic location in the Warehouse District. Destination weddings account for almost a quarter of all weddings in the United States, according to TheKnot.com to the tune of $18 billion in 2011, according to the magazine Destination Weddings & Honeymoons. Wedding planners, catering managers, police officers, bands and event coordinators all said the wedding industry in New Orleans for out-of-town couples was growing rapidly. No one knows exactly why. Some credit the city’s rebuilding after Hurricane Katrina, social media and sites like TheKnot and StyleMePretty.com for promoting the idea that a wedding can be more than a sit-down dinner at the local hotel ballroom. The couple at Race & Religious that Friday, Kristen Hull and Michael Kohn of New York City, found their dream wedding locale on Pinterest and used a New Orleans wedding planner, Elyse Skansi of Tying the Knot Wedding Coordination, to help them pull the event together. Dressed in a Jenny Packham gown, Ms. Hull said, “She made it all possible,” referring to Ms. Skansi, who provided vendor recommendations and handled all of the logistics. Ms. Hull, 28, and Mr. Kohn, 31, had a second line band, and marched on a small plot of land next to the venue with parasols and big orange fans. Cars honked and drivers yelled, “Congratulations!” The march caught many of their out-of-town attendees off guard. 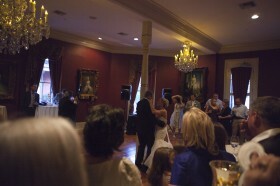 Price also contributes to the popularity of weddings in New Orleans. In New York City the median cost of a wedding is $86,500, according to industry figures, well above the national average of almost $30,000. In New Orleans the price is closer to the national average. Race & Religious, for example, charges $8,000 for a high-season Saturday rental, plus food and beverage expenses. “You can have one hell of a party for a third of the price in New York,” Ms. Skansi, the wedding planner, said. Plus, she added, all that out-of-towners need for transportation is a cab from the airport because hotels, bars and restaurants are centrally located and getting around is easy. Ms. Costello pointed out that the natural and historical décor of many places in the city also helps cut down on decorating costs. The church where the Kasts were married, the Old Ursuline Convent, is over 200 years old, and Muriel’s, owned by Ms. Gratia’s family, was constructed in the 18th century. The walls have exposed brick, and the terrace on the second floor overlooks Jackson Square. 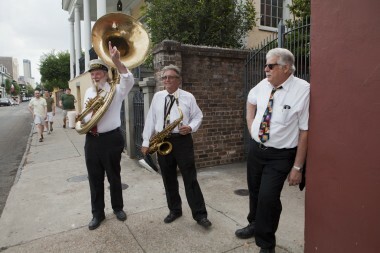 The brass band that led Ms. Gratia, Mr. Kast and their wedding party through the French Quarter is the Storyville Stompers, and it is arguably one of the most popular second line brass groups in New Orleans. Founded in 1981, the band wears uniform costumes of black pants, white shirts, ties and suspenders. “It’s tradition,” said Woody Penouilh, the band’s leader. They also wear black and white captain hats embroidered with “Storyville Stompers” in gold. Mr. Penouilh said he too has noticed the boom in requests for second lines from out-of-town brides. “I don’t know how it became so big,” said Mr. Penouilh, 70, who plays the tuba. Mr. Penouilh charges a flat fee of $895 for 45 minutes of his six-member group. In addition to the band’s fee, a couple must pay $50 for the street permit and $325 for the minimum three police officers on motorcycles who lead the bridal party. For comparison, imagine the New York Police Department shutting down 10 blocks in the middle of Manhattan for your wedding day for less than $1,500. The night before the Kast wedding, the Storyville Stompers gathered outside the Chicory, another popular Warehouse District wedding location. This second line was at the end of the wedding at 11:30 p.m. 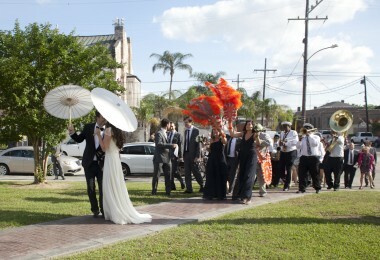 The band marched the wedding couple, Brittany Blenkarn and Joshua Craven, for approximately 30 minutes around the streets of New Orleans playing songs like “Bourbon Street Parade,” “Jambalaya,” “When You’re Smiling” and “The Saints.” The couple carried the traditional parasols and guests waved embroidered white handkerchiefs with the couple’s name and wedding date on them. People on the street cheered them on, snapped photos with their iPhones or just stopped to witness their joy. “It’s just another day at work for us,” said Steve Burke, 61, the band’s saxophone player, as he wiped the sweat off his face with a towel.